Since my first casino game I ever played was poker at aged five, I sometimes question why I’m not the female equivalent of Dan Bilzerian. It wasn’t until entering the land of Vegas, at the fresh age of 21, to play the first casino game I had ever learnt that I realised I didn’t have a poker face. Despite losing multiple hands of poker at the iconic Caesars Palace Las Vegas Casino, I still find it to be my favourite casino game but it appears I am better suited playing online. I was taught how to play poker by my Grandad. While my mother and father would work, I would stay with my grandparents in the daytime prior before I was sent to school. We would play many games, but poker was always my favourite. Back then, the Internet was a fictional fantasy while online poker was unheard of. Additionally, I was unaware that there were variations of poker and that five card poker was one of the most basic versions I could learn. The reason why my Grandad most likely taught me this version it is because it is so simple – all players need to do is create the best possible hand in one draw. With the knowledge of my hand and the chance to exchange cards players, and the lack of awareness that my Grandad would go easy on me, I was required to make a bet. We often wagered treats for the winner’s pot. After the second draw or round, we would check who has the best hand and whoever did, would win. We used a 52 card deck, which is the most common amount of cards in play for five card poker, and although it was just the two of us playing it is possible for up to 10 players to try their hand. Poker was the first casino game I played and gave me the confidence to try my hand in Vegas. What I wasn’t taught then was that there will usually be one of two methods in place when playing and this was by a dealer at Caesars the first time I played poker at a land-based casino. This was taught to me unknowingly when I played five-card poker with Granadad although we weren’t playing with real money. it is the most common method especially when playing games at home. It requires each player to put a payment in before they start playing. This is known as the ante. All players must put in the smallest amount accepted. It is in place to make sure that if a player folds every round they will slowly lose their money which in turn means players have a reason to play their hand meaning more players will keep playing. These are also commonly used in tournaments to keep the game going. For Grandad and I, we would wager one treat from our ‘account’ as the ante. Blind bets is another method however I was not ever taught this by Grandad even unknowingly and I discovered it in Vegas when the dealer spotted that I had never heard of the rule from a mile away. Rather than every player putting in before the hands are dealt, only the two players which are sitting to the left of the dealer are required to put any money in. Usually the first player to the left pays the smallest amount while the second player to the left pays double this amount known as the big blind bet. The size can be predetermined and is actually quite common in the poker variation Texas Hold’em. Three blind bets can sometimes be implemented while only one can be used. Regardless which method is in place, it is important that players have a good poker face, something my Grandad had mastered to a tee. A good poker face is essential when it comes to playing any variation of poker. It involves creating a blank expression and hiding any reaction you may have to the set of cards you have in your hand. If another player sees that you are disappointed in your hand this may encourage them to stay in the game and ultimately beat you, or if you notice that a player is overly excited with their hand it could be an indication you should fold which will ultimately help you. 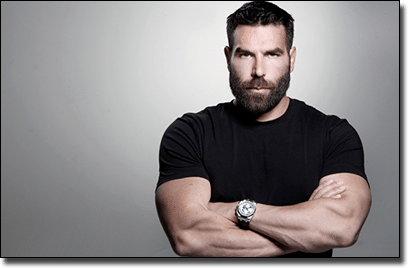 Dan Bilzerian, the poker face champion. I learnt this the hard way in Vegas as I revealed I had a very poor hand by shaking my knee anxiously and other players picked this up instantly. I did not realise and did not fold and ultimately lost my hand to players with average hands. I did see a player not reveal his cards when he had won after every other player had folded. This is actually a great example of a good poker face strategy as it means no one can see how that player reacted to those certain set of cards. Poker faces are very important at land-based casinos, however with the introduction of the Internet and online poker games, there is no requisite to have a poker face when entering the virtual casino reality. This is why I now play the first game I ever played online. With a shaky knee I now know I am never going to become the female version of Dan Bilzerian, but I still want to keep playing the first casino game I had ever been taught so I play online. Initially, I was quite oblivious to the criteria which should be ticked prior to signing up to an online casino, but with a little research I was able to pay safely and securely online. I recommend ticking the follow criteria off when finding an online casino to play at and by doing this myself I found that my experience playing poker was equally as enjoyable if not more so than playing at a brick-and-mortar casino and although I can’t win treats, wagering real money is just as thrilling. No mater what casino game you want to play, provided it is available online, you should always do your research. I make sure that the online casino I am playing at is reputable by looking up the online operator’s license and what jurisdiction it has been provided by. I found this by scrolling to the bottom of the online casino’s homepage. Examples of online casino licenses from trusted gambling jurisdictions which are advanced in the gaming industry include Malta, Alderney, Isle of Man, Kahnawake and more. Depending on the online gambling laws in your country, players are legally allowed to play at online casinos which are licensed by these jurisdictions. Another important aspect to note and do your research on is whether or not the online casino is tested and regularly monitored by a third party organisation. A great testing agency is eCOGRA which reviews online casinos monthly to make sure games are fair for players. Make sure you do the research on a company if you haven’t heard of it before as it could be an indication the online operator’s are dodgy. I found the testing agencies listed at the bottom of the homepage at many of our recommended online casinos and did a simple search on it. Always learn how to play the game online before gambling with real money. This will save you from dwindling away your betting account on silly mistakes which could have been avoided. You can either read the e-books reputable online casinos may offer, the instructions of the game, or even play in free mode before making a deposit. Although I knew how to play five-card poker, I played in free mode first to make sure I knew exactly how to make a bet and play my hand. My knee also was free to shake whenever it wanted to regardless what mode I played in. When playing at land-based casinos it can a lot easier to stop when you have run out of cash in your wallet. When playing online however it can be quite easy to go overboard with a linked account, especially if it is a credit card. Set a limit and stick to it. If you are one to go overboard it might be best to set up an e-wallet, such as Neteller, and transfer the set limit of money to the account, and then make a deposit via this method. That way once you have run out it will take a bit more effort then just topping up your account with the linked credit card and you will have a chance to step back and evaluate your funds. I often dabble in a range of casino games and when I went to Vegas for my 21st birthday I found myself mainly playing blackjack due to my friends also already knowing how to play. However whenever I play poker, online or offline, I find it the most enjoyable -even if I lose. This is because the game has a sentimental meaning to it. Learning to play from my Grandad brings back great memories when I play, including pocketing a handful of butterscotch lollies after beating him in poker for the first time. If you’re looking for a good online casino to learn playing casino games, we highly recommend Raging Bull Casino as the safest and best online casino providing support for players from United States, which offers free play in practice mode and real money bets.